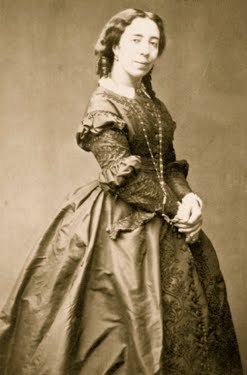 Learning to sing is an interesting business, as is research into how that business was conducted in the past by famous voice teachers, in this case, Pauline Viardot-García. Something she taught came to mind recently after I had a conversation with a colleague, who observed that singers of yesteryear—and we're talking the beginning of the 20th century—sang with more head voice than they do now. It it true? I guess that depends on how one listens to early gramophone recordings, which didn't capture the voices of women very well. That said, it is a perception that rings true to my ears. Of course, one has to listen to a lot of old recordings to make this deduction, which is easily done now that Youtube is flooded with them. Now to my remembrance. I have within my files at least five references to Viardot-García teaching her students to sing very quietly during beginning practice, often in octaves, starting in lower middle voice, and going as high as possible, which is not something you hear students, either men or women, doing today. What might this accomplish, and how would it have been done? Let's say the student has a good handle on the concept of "Singing Position" that has been articulated by Herman Klein, and which is an essential García School teaching. The student who has this knowledge will find that if their Singing Position is adhered to religiously while singing very quietly, the ascension into the higher range will—after some practice—hold no terror. In fact, singing quietly will help the student listen to what they are doing—a very good thing. The student will also find that when full voice and mezza voce is attempted (hint: the breath must stand still during quiet practice and simply be reinforced without force), the resultant tone will be oriented towards the head. So there you have it: my theory on why we hear what we hear in old recordings, that is, pure clear vowels and beautiful singing. The curious reader may want to find my posts on Emi de Bidoli for additional information. As well, if the reader has arrived late in the game and has no idea what I am talking about regarding Singing Position? No worries. Use the labels below or seek out Klein's manual.